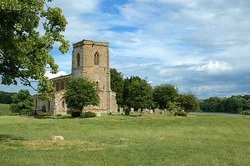 The Church of St Mary stands a little to the east of the Hall in the ornamental landscaped Park, the work of'Capability' Brown. The present building dates from around 1209, although it has been suggested that there was possibly an earlier wooden 'Saxon' church on the site. The medieval building was brought into the 20th century when electric lighting and heating was installed in 1999. The church, founded by John de Fawesle (Fawsley), the first recorded vicar, consists of the west tower, nave (with two aisles), south porch and chancel. The tower, dating from the early 13th century, is built in the Decorated style of architecture and has four Y shaped bell openings and several corbels around the parapet. These take the form of animal heads. Above the tower's west window is an open niche, which at one time, probably housed a statue of Our Blessed Lady. The nave has 13th century bays consisting of octagonal piers with double chamfered arches. Above these are the large 17th century clerestory windows, very similar to the 'Brew House' windows in Fawsley Hall. Box pews are a feature of the church and they contain medieval carved panels which give some insight into domestic beliefs and the attitudes of people at the time. They were restored by James Dawson in 1992. The main glories of St Mary's are undoubtedly its magnificent monuments, and there are fifteen of these dating from 1516 to 1856. The oldest is the brass of Thomas Knightley dated 1516, which shows him with his heart engraved above his portrait and with heraldry above this. surrounded by the twelve graceful figures of their children - the weepers - at the sides of the tomb. There are four girls and eight boys, and the clothes,particularly of the latter, give an indication of their professions. Three members of the Knightley family are commemorated in the massive monument on the north wall. This chronicles the virtues of the well-known family between 1566 and 1619. The memorial is aglow with colour - including fine gold - and was restored in 1930. There are two figures at prayer, supporting a great pediment, with cherubs sitting aloft. An inscription reads 'Dust thou art and to dust thou shalt return'. Five large architectural tablets in the chancel record the deaths of other members of the Knightley family in 1661, 1670, 1728, 1738 and 1741. The monumental tablet to Jane Grey Knightley has a small bust on top. Two very similar monuments of Devereaux (1681) and Elizabeth (1715) are in the north aisle. Both are set on tall pedestals, the latter is richly carved with majestic garlands and flowers. In the south aisle a very fine pre-Grecian monument without any figures, is a memorial to Lucy Knightley by Richard Westmacott, who trained in Rome under Canova. Two other interesting 'possessions' are the stone bible on the window ledge in the north wall, and the modem pulpit, with many carved emblems of the Passion. The prayer desk and the altar rail appear to be of the early 19th century, and are in the style of the early Gothic revival. It has been suggested that the altar rail came from the Minstrel Gallery in the Hail. The plant troughs outside the north door are in memory of Jane Picton-Warlow, a much-loved local personality and fund-raiser.